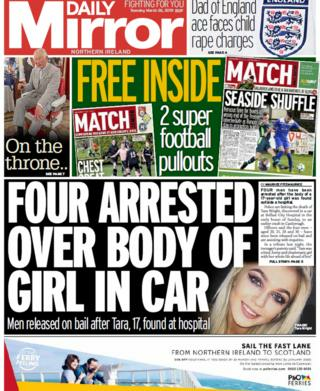 For the second day this week, the investigation into the death of a teenage girl, whose body was found near Belfast City Hospital, makes most of the front pages. The victim was named as Tara Wright, a 17-year-old from Banbridge. Her parents said they were "devastated" by her death. Four men, aged 20, 21, 28 and 30 were arrested on Sunday in connection with the incident. They have since been released on bail. Her family released a statement on Monday. It said: "Tara will be remembered as she lived, a fun loving, energetic and vibrant soul with a zest for life that could bring joy to all around her." The Daily Mirror reports that Miss Wright's friends described her as someone who had a "bright future ahead of her." Meanwhile, the News Letter splashes with details of a report on the "structural maintenance" of Northern Ireland's road network. The audit report, published by auditor general Kieran Donnelly, will cost £1.2 billion to bring it up to scratch, it said. The report outlines how "decades of funding shortfalls are having a deteriorating effect on the overall condition of Northern Ireland's road network". The Irish News has the story on plans for a £300m gas-fired power station to be built in Belfast. Some Northern Ireland voters have a "chip" on their shoulder after Tayto crisps were left out of a Channel 5 survey on "Britain's Favourite Crisps". Walkers crisps took the top spot, followed by Pringles and Doritos.